Hacking, left, shares a podium with Sukuki’s Spies and Mladin. AMA Superbike rider Jamie Hacking will get a seat on Kawasaki’s Moto GP bike at the Laguna Seca round. Hacking was picked to replace John Hopkins, who injured his left leg in a crash last month, on Kawasaki’s Moto GP team. 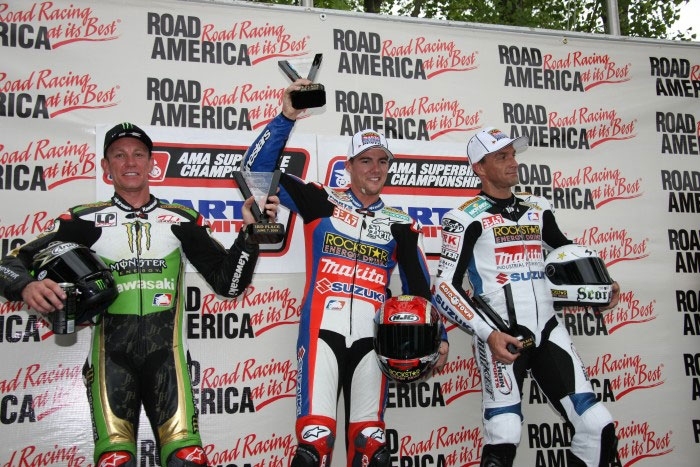 He has three AMA championships and has achieved six podium finished in the AMA Superbike championship this year. Hacking is confident he’ll beat Roger Lee Hayden’s 10th-place, best-American finish at the 2007 U.S. Moto GP round. He called the Kawasaki Moto GP bike "an amazing machine." "I can’t believe how sophisticated the electronics package is on the bike." The U.S. Grand Prix takes place on July 20.